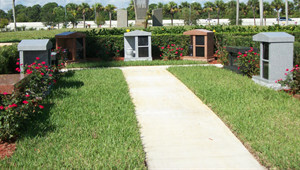 Palm Beach Memorial Park would like to introduce its two new developments, the Palms II Mausoleum and our Holy Spirit Garden. Call (561) 585-6444 for the best selection. Watch our progress for each of our new developments below. These estates will be located in our Garden of Prayer ll. Offering an alternative cremation solution to the families we service. The estates come in several different colors. This new mausoleum will include both casket and cremation spaces. Our new Holy Spirit Garden is set within a very tranquil area of our cemetery, flourishing with trees, flower beds and abundant greenery. This new garden features double depth and single depth lots at a moderate price. Feature spaces available while they last.